Congratulations to Tiger Muay Thai and MMA Phuket’s fighter Ngoo Ditty, who holds the honor of being Thailand’s first homegrown MMA fighter. Having already competed Internationally in Pro MMA in Singapore, Malaysia, Russia, and Hong Kong, it was a rare opportunity for him to compete in Thailand when he face Phuket Top Team’s Daniel Mashamaite at the DARE FC event held in Bangkok Thailand. Daniel Mashamaite a multiple time Muay Thai Champion from South Africa, struggled to keep the fight standing as Ngoo displayed great wrestling and BJJ taking his opponent down in all 3 rounds and controlling the action. Putting forth a dominate 2nd round Ngoo nearly ended the bout with strikes before the round came to a close. 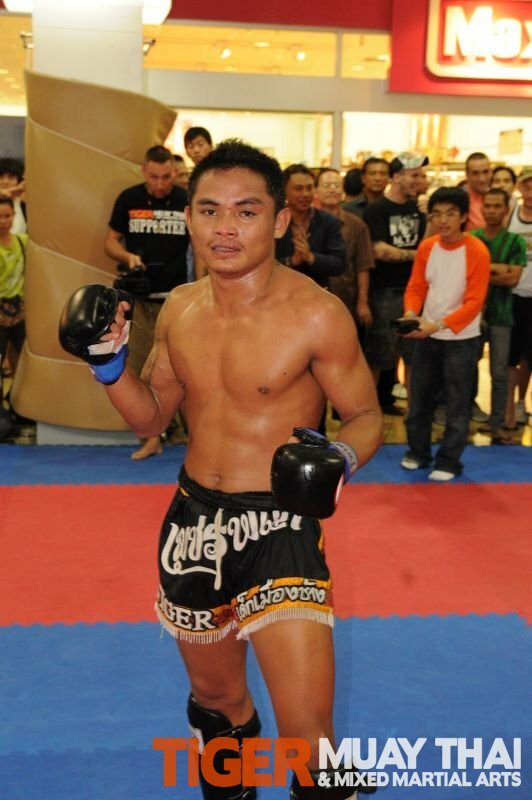 Moving his professional record to 4-2, look for Ngoo to continue establishing himself as Thailand’s top MMA fighter. Also on the card, TMT fan favorite ‘Milky’ suffered a disappointing 3 round decision loss to Will Chope of the Taiwan Top Team competition squad. Having suffered from an injury 2 weeks leading into the bout, Milky appeared to suffer from cardio, during the three rounds of sloppy ‘Wall and Stall’ strategy utilized by his opponent.